In this post Deveen was discussed, a cigarette manipulator. Along with cigarette manipulators, tricks involving cigarettes have become much rarer as smoking had decreased and attitudes towards smoking have shifted. In this post effects that use cigarettes are going to be explored. First, here are some gimmicks that would have been familiar to cigarette manipulators. All of these would be used by the magician without ever being seen by the audience, assuming all goes to plan. The large dropper at the back was manufactured by the Australian magician Alma, the other items are from a variety of suppliers. Davenports had a section devoted to cigarette tricks in many of their catalogues, below are some of their items used in cigarette manipulation. On the right is a 1930s cigarette box which allows you to produce cigarettes from the air one at a time and drop them into the box until it is full. It appears utilitarian but contains quite a complex mechanism. In the foreground are two cigarette pulls, the larger one allows a cigarette to be changed into a silk. The boxed items are all cigarette catching gimmicks, probably the most widely produced cigarette trick. Davenports also made a special cigarette holder that allowed the instantaneous production and vanishing of a cigarette. This was most famously used by the superb manipulator Cardini. His act combined many forms of manipulation and was notable for being performed with gloved hands. Unlike Deveen in the previous post Cardini had a hugely successful career, performing on the best circuits. This image is a full page from a variety programme for the London Palladium in 1937. Cigarette magic wasn't just used in manipulation acts though, it was perfect for close up. At a time when cigarette smoking was widespread, they were just as useful as coins for performing pocket tricks. Alongside sleight of hand effects with cigarettes dealers produced apparatus such as the Davenports examples below. On the right are two tubes that allow a lit cigarette to turn into a match, these are beautifully engineered, probably in Germany. The tube on the bottom left allows a real cigarette to vanish from a tube using the Baffler Box principle, hence the name "Baffler Vanishing Cigarette". Cigarette effects have naturally declined as smoking has gone out of fashion, but the gimmicks and sleights can still be applicable to similarly shaped objects today. It's interesting to look back at how many cigarette effects were available that simply would not work in a modern magic act. Effects using pipes and cigars were also popular, but I'll leave that for another post. Imp Bottles, a Popular Pocket Puzzle. One of my favourite magic tricks masquerades as a puzzle, the imp bottle. This tiny bottle can be laid down on its side by the magician, but anyone else trying to push it on its side can't, the bottle pops back upright. Although it's presented as a puzzle, it's one the participant will never be able to solve as it is really a trick and requires a little extra something only the magician has. An early description of this effect appears in Hoffmann's Modern Magic as The Bottle Imps. He's clearly describing a dealer item already popular by 1876. He mentions that they can be made of papier maché or other light materials, though most are made of wood or, more recently, plastic. Below are some in my collection in approximate chronological order. These examples were made in the 1920s by a German firm, most likely Kingl. They have small paper champagne labels and originally had painted gold collars. This example, probably also made in Germany, has a more bulbous shape and a flat bottom. Instead of wobbling around and settling upright like most bottles this has a very positive action. You can see the gold collar more clearly on this example. I think the reason the collar is so often rubbed can be explained by the handling used by the magician when introducing or removing the gimmick. This later example is slightly larger than the above examples and much brighter. I feel the longer the neck gets in comparison to the bottle's body the more it points to the method, though it's still very deceptive. This item was retailed by Ellisdons from the 1950s. It's unusual in being completely of metal construction. This material only works here because the body is of light spun aluminium and the base the usual lead. Here the bottle shape used in most modern plastic examples is introduced. Ellisdons also retailed this example in the old shape. Although it looks similar to the wooden examples at the top of this article it's of plastic construction with a moulded lead base. The Imp Bottle is still very popular today, available as a pocket money item and as a toy in Christmas crackers. Unlike most cheap plastic items this effect is truly deceptive and introduces a small amount of sleight of hand instead of being self-working. In this feature article I've gathered together information about Ellisdons. As a business that firmly concentrated on the novelty and toy end of the magic market it isn't often written about in depth. This is despite its' considerable success over many years. Solid facts about Ellisdons are hard to come by, no longer around to write its' own history and not being a social hub for professional magicians, Ellisdons rarely appears in magic history books. For this article I'm indebted to the late Allen Tipton who, aside from greatly encouraging my interest in magic history when I was a boy, wrote a potted history of Ellisdons for Abra Magazine. He later posted it online and it can be found here. Much of Allen's information came from his correspondence with Tina Futch, a member of the Ellisdon family. In this article I've stuck to the history of the business, Allen's articles contain more Ellisdon family history for those interested. For simplicity, I will refer to the company as Ellisdons throughout, though it was sometimes given its full name Ellisdons and Son or E&S for short. If an Ellisdons item is marked or packaged they often used the E&S abbreviation. So, starting at the start, Ellisdons always advertised that they were founded in 1897. Based in Sydney, Albert Ellisdon sold tools and equipment to Australia's growing agricultural and gold prospecting population. Ellisdons didn't have a chain of shops, they operated through mail order posting items to individuals, a business model kept for generations. Very little is written about this period in the company and I have tried, and failed, to find any adverts or ephemera from their time in Australia, it's possible they were a very small outfit. The age of the company may have been an exaggeration, I've always thought it was funny they claimed to be founded a year before Davenports. The company as we know it really begins when Albert, his son Ernest and grandson Bryce Ellisdon moved to London in the early 1930s. This seems to be when they change tack and begin trading in jokes, novelties and magic. Allen Tipton points out that at this time Davenports were the only retailer of magic equipment that also embraced jokes, novelties and puzzles, so there was space for Ellisdons to move into this area. Here are some early Ellisdons items. What made Ellisdons different from other magic dealers of their time was their target market. Magic shops traditionally depended, and to some extent still do depend, upon a large group of enthusiastic amateur and semi-professional magicians. Generally speaking, amateur magicians like to regularly buy new exciting props. So keeping up with the demand for new, well made and novel props was essential for these dealers. Ellisdons didn't invest in making novel, new effects or importing the latest American ideas, they aimed at the casual child magician, schoolboy and prankster. Here are some of the jokes and puzzles they sold at their height. Alongside these joke items they also sold small sets of jokes. Here is a very early example of one such set. Targeting this market they concentrated on small, easy to post, items from little packet card tricks to stink bombs and fake spiders. They advertised heavily in comics to grow a huge mailing list of joke and novelty fans. At their height they had a circulation of over 100000 on their mailing list to receive catalogues. One interesting note is that Ellisdons' first magic and joke catalogue was printed by Davenports, as covered by Fergus Roy in The Davenports Story. Ellisdons and Davenports traded with each other as well as being competitors for the whole of Ellisdons time in business in the UK. After this first catalogue, Ellisdons regularly printed their own. These comic and catalogue adverts featured fun, mischievous artwork drawn in-shop by Bryce Ellisdon. These enticing adverts are probably what has been remembered most about Ellisdons and two reprints of their catalogues have been published since the shop closed. One of these reprints is still available in this mixed pack of reprinted 1960s ephemera. Ellisdons was very much the British parallel of the American companies covered in Kirk Demarais' book Mail-Order Mysteries. Below are the parcels that would make a schoolboy's heart leap with excitement. The pink slip is a substitution form and the blue sheet is an order form. More than any other magic company of the time Ellisdons concentrated on mail order. The few shops of equal or bigger size to Ellisdons boasted showrooms and sometimes even small stages for the demonstration and examination of apparatus before purchase. Ellisdons didn't stock this high-end professional apparatus and instead depended on colourful descriptions and illustrations to secure purchases. Here are some of the magic items Ellisdons sold at their height. Ellisdons' best selling magic items were probably card tricks. They were cheap to print or import and cheap to post. They sold their own marked cards and also had a card tricks magic set, really just a collection of packet tricks boxed together. Below is a photo of some of the card tricks Ellisdons sold, on the left is the card magic set with contents in a fan below the box. In addition to their direct mail order business Ellisdons wholesaled their stock to chain shops, independent toy shops and department stores. Their biggest customer in this field was almost certainly Woolworths (the UK, not the US, chain). With over 1000 shops children had access to magic tricks and jokes even if their town had no dedicated magic shop. The packaging followed this market and Ellisdons produced a huge range suitable for display on simple self service racks. I've mocked one of these up to display some of my Ellisdons items. In addition to individual items Ellisdons also put together magic sets for shops. Much like Davenports had done with their Maskelyne's Mysteries sets discussed here, Ellisdons allowed Gamages and other shops to badge their sets. Below is a Gamagic set made by Ellisdons for Gamages. Ellisdons also made their own magic sets for sale by mail order and in toy shops. Here is an example from the 1940s or 1950s. Below is an example from the 1960s or 1970s. I'd briefly like to look at two items that sold like hotcakes for Ellisdons for many years. Both were perfect for Ellisdons' style of advertising and probably over promise on what they can deliver. Here's Ellisdons' "Vamping Chart". This proudly boasts that "without the slightest knowledge of music whatever" one can play music on the piano. The idea being that this chart rests on the piano above the keys and by learning a few, supposedly simple, rules anyone can play along to popular tunes. Although they sold many thousands of these they can't work that well as no one is selling them today. If there were to be one product Ellisdons is most remembered for it is likely the Seebackroscope. It was available for many years before Ellisdons marketed it in the UK, but it's popularity spread through the back pages of comics and they sold huge quantities of these little gadgets. Much like the Vamping Chart this over promises somewhat. It does allow you to see a very small amount slightly behind you, but the hijinks children may have imagined possible would probably not have been. Sid Templer, the founder of novelty shop Hawkin's Bazaar wrote in the forward to an Ellisdons catalogue reprint that he had ordered a Seebackroscope as a boy. He complained to Ellisdons that it didn't work to his satisfaction and they sent him half a page of stamps as compensation. As mentioned, Ellisdons were targeting young amateur magicians and their publishing history reflects this. They published very few titles, and they were very general and aimed at the beginner. Although their range was small they sold huge quantities of these small-format, cheap books. These are some of the easiest second hand magic books to find today, despite the fact that they fall apart very easily and most printed have probably ended up in the bin. They have wonderful, full-colour covers to catch the eye of aspiring magicians. An unusual anomaly from Ellisdons is the hardback version of J. C. Cannell's Modern Conjuring. It is much larger than the paperback above and has extra sections on a range of other entertainments. Though still aimed at the beginner, it's well printed and bound, in stark contrast to Ellisdons paperbacks. Published in 1938, in the first decade of Ellisdons UK business, maybe it was their first publication (excluding catalogues). Possibly it simply didn't sell well mixed in with the cheaper products on offer. I don't think a second hardback edition was printed. Although they're mostly remembered as a mail order business they did have a public shop. They settled in the High Holborn area of London and had a large shop there for many years. In 1959 they moved from 245-246 to 145-146 High Holborn, very close to Davenports' 111 High Holborn address. It's not easy to pin down when they moved out, but it seems to have occurred in the 1960s. Certainly by 1969 they were no longer in London as can be seen from this catalogue on The Davenport Collection website. It's very hard to find images of the inside of the shop or the staff who worked there, if anyone has any I'd be very interested to see them. One thing I did find was this clip from 1963 which shows members of the Ellisdon family joking with each other. I assume that at the head of the table is Ernest Ellisdon as Albert would likely have died by this time. Ellisdons had a factory in Bedford on Kempston Road while they were still based in London. At its' peak it was a very large operation with 40 employees at the factory and more than 100 craftspeople working from home in the local area. Some of the work would have been manufacturing items, but much or it would have been packaging and re-labelling imported goods. With the closure of their London shop Ellisdons became entirely based from this factory until 1980 when, in steep decline, it briefly moved to Cornwall before closing altogether in 1982. The family blamed the decline on the changing tastes of children, moving away from cheap jokes towards computer games. Ellisdons' mailing list was purchased by a different joke firm, Jokes Corner who advertised in comics and magazines to sell novelties. They still trade under the name Magic By Post, in fact I remember ordering their catalogue as a boy and it coming with a free trick, it was an Ellisdons Three Card Monte. 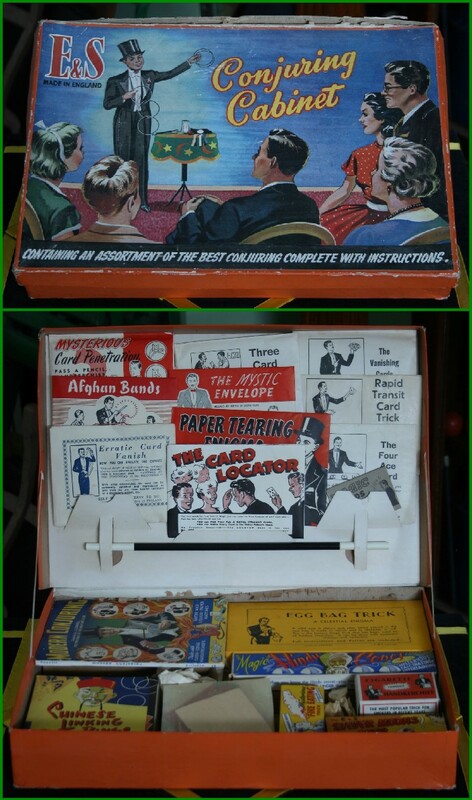 They still sell these, along with Two Card Monte packet tricks in their distinctive Ellisdons packaging.